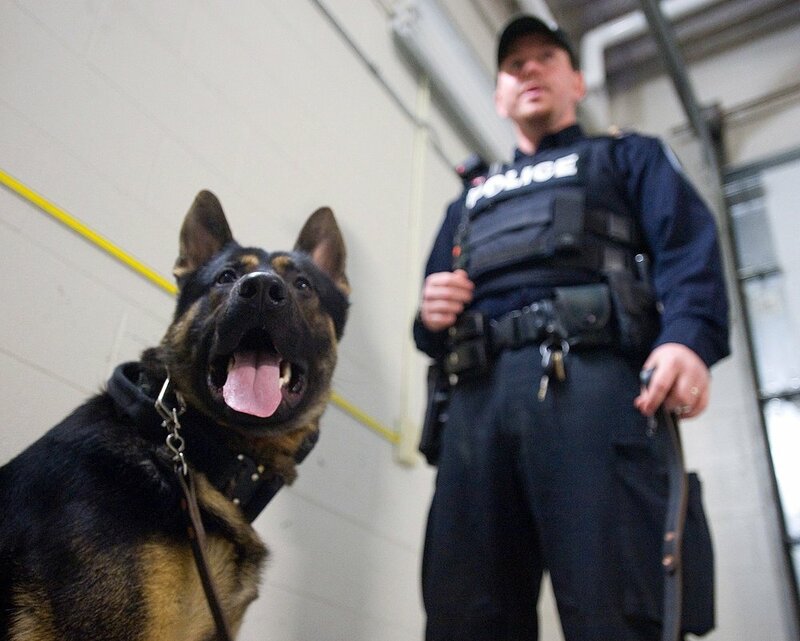 After serving the community for the past five years, K9 Wolfe (partner Constable Tim Fish) and K9 Hal (partner Constable Sam McCullum) are retiring from our K9 Unit at the end of this year, Peterborough Police Service says in a Facebook post. “In just a few more days they will retire from active duty and begin enjoying retirement living inside their partner's home,” police say. 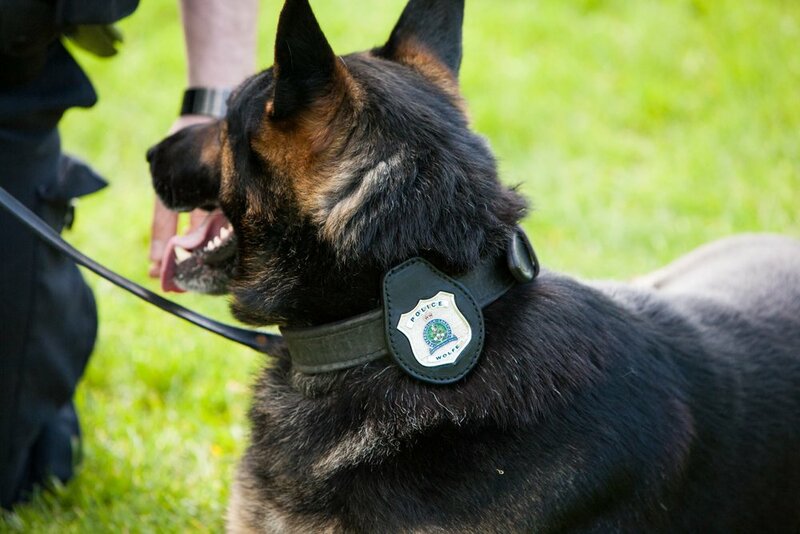 Police thank Constable McCullum and K9 Hal along with Constable Fish and K9 Wolfe for their dedication and hard work in serving Peterborough, Lakefield and Cavan Monaghan. 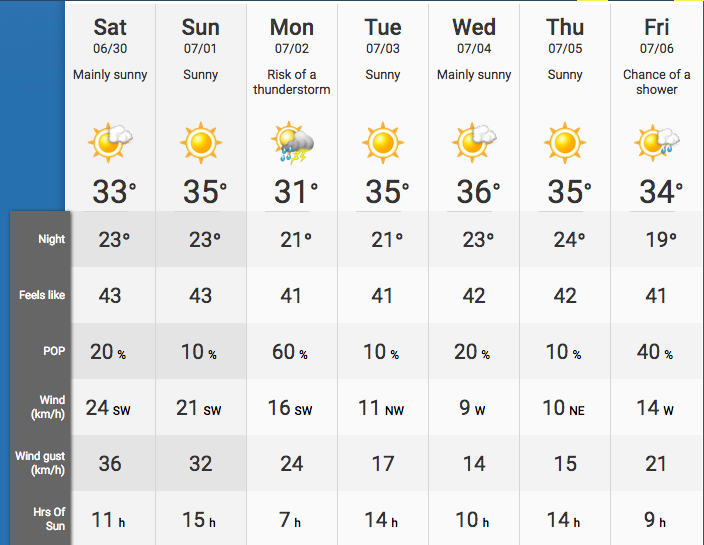 Peterborough Public Health has issued its first heat warning of the season, with daytime highs in the low to mid-thirties forecast and humidex values in the mid-forties. Overnight low temperatures will only fall to the low twenties, providing little or no relief from the heat. The heat event is expected to start Saturday, June 30th and extend through to late next week. Peterborough Public Health asks that you remember to call or visit family, friends and neighbours—especially seniors who live on their own—to make sure they are alright. Extreme heat events are a potentially significant health risk and can have a severe impact on the health of vulnerable populations including infants, the elderly, shut-ins, persons with chronic diseases, the morbidly obese and the marginally housed. The risk of heat-related illness increases with the amount of time spent in the heat, the temperature and an individual’s sensitivity to heat. If you feel faint, find it hard to breathe, or feel confused and disoriented because of the heat, call your doctor. In an emergency, call 911. -> Drink plenty of water, even if you don’t feel thirsty. This decreases your risk of dehydration. Thirst is not a good indicator of dehydration. Crestline Coach and Ferno Canada have announced that Peterborough Paramedics—which serve the County and City of Peterborough—will be the first EMS Service in North America to pilot the ACETECH iN∫COMMAND solution. 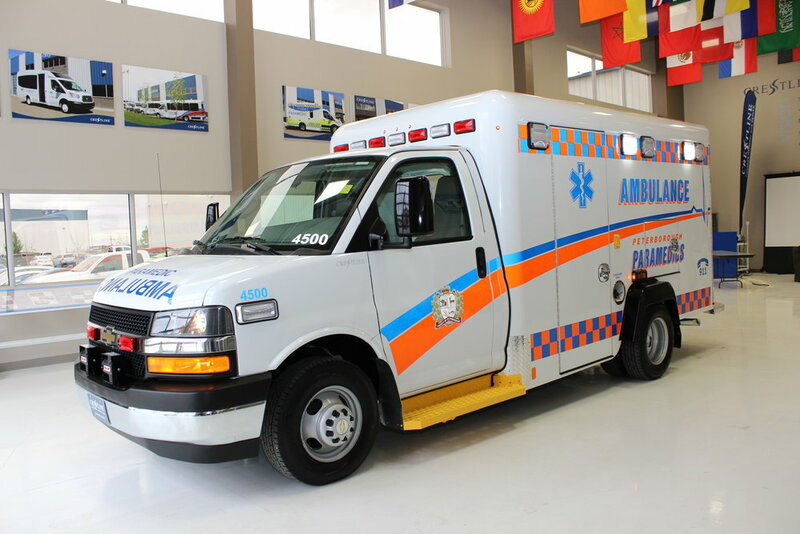 Crestline in partnership with Ferno customized three New Era ambulances for Peterborough Paramedics to meet the specific needs of their EMS service. -> It is the ultimate control center designed to provide emergency service operators full control of the ambulance by managing and monitoring auxiliary controls and safety equipment from a single touchscreen device. -> This comprehensive and user-friendly interface optimizes performance by providing access to vital information in real-time and improved asset management. -> The customizable touchscreen makes operation effortless, easy to view and ultra-responsive even while wearing medical gloves. “My vision for these vehicles is based on my belief that technology is evolving at such speed that we need to be futuristic in our approach to vehicle design," says Peterborough County-City Paramedics Chief Randy Mellow. The Paramedics Chiefs of Canada (PCC) get the first glimpse of Peterborough’s state of the art ambulance at the annual PCC Leadership Summit & Conference beginning Wednesday (June 13th) in Edmonton, Alberta. 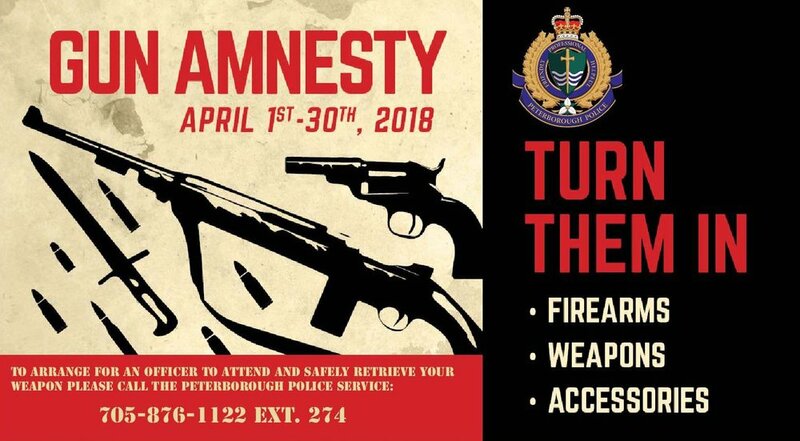 The Peterborough Police Service is participating in this year’s Gun Amnesty program in April. The service is one of many police services across the Province, including the OPP, participating in the Gun Amnesty program. The Gun Amnesty is for any Ontario resident who wants to voluntarily surrender unwanted or illegally-owned firearms, weapons, accessories or ammunition. The Amnesty is a way to provide citizens with a safe way to surrender weapons and enhance public safety. "The safest way to handle an unwanted or illegally-owned firearm is to turn it in for destruction,” says Chief Murray Rodd of Peterborough Police Service. Interested gun owners are strongly urged to call the Peterborough Police Service’s Alternative Response Unit (ARU) non-emergency number at 705-876-1122, ext. 274 to arrange for officers to attend and safely retrieve the weapons. NOTE: Under NO circumstances should anyone deliver guns or ammunition directly to police facilities. 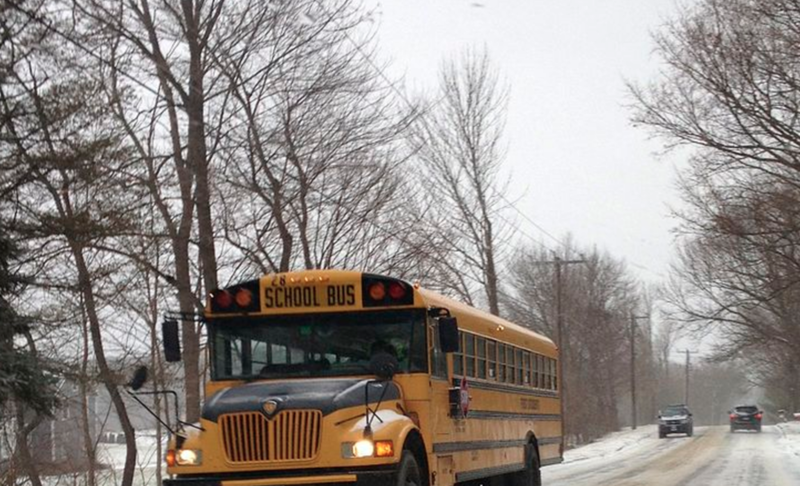 Peterborough Police Service's Traffic Management Unit has been receiving numerous calls, emails and voice messages with respect to motorists disobeying school bus flashing lights. Motorists are reminded that unless there is a physical barrier between the travel lanes, they are required to stop for a school bus when the bus is fully stopped and the lights are flashing. 175 (11) Every driver or street car operator, when meeting on a highway, other than a highway with a median strip, a stopped school bus that has its overhead red signal-lights flashing, shall stop before reaching the bus and shall not proceed until the bus moves or the overhead red signal-lights have stopped flashing. R.S.O. 1990, c. H.8, s. 175 (11). “median strip” means the portion of a highway so constructed as to separate traffic travelling in one direction from traffic travelling in the opposite direction by a physical barrier or a raised or depressed paved or unpaved separation area that is not intended to allow crossing vehicular movement. The Traffic Management Unit will be devoting resources into educating and enforcing this very serious Highway Traffic Act offence, which comes with a set fine of $490 and 6 points. Please share this post to remind motorists. The Peterborough Police Service’s Traffic Management Unit just unveiled its newest crime prevention and proactive policing program: The Automated Licence Plate Recognition (ALPR) system. -> Using infrared technology, the ALPR system—consisting of three sophisticated cameras installed to the roof of a Traffic Unit SUV (see pictures)—scans licence plates at a rate of three plates per second. -> The system looks for violations including but not limited to expired validation stickers, stolen licence plates and suspended and unlicensed drivers. -> The ALPR works in conjunction with the new in-car tablets which also contributes to the officers’ efficiency. Traffic Sergeant Jeff Chartier says that the camera system reads licence plates and compares the plates to a known list that is downloaded daily. This includes information regarding stolen plates, unattached plates, prohibited and suspended drivers. The system also allows for officers to input licence plate information for various alerts, including AMBER alerts where time is of the essence. Police say the system is not replacing officer interaction with the public and that traffic officers are still very much required for interaction and action with the public. If a plate scans a suspended driver, the officer will still have to speak with the driver as it may be another person, other than the registered owner of the vehicle, driving that vehicle. The ALPR system allows officers to multitask and conduct other traffic enforcement initiatives, such as speed enforcement, while the ALPR system is running in the background. The Peterborough Police Service has the one traffic SUV (pictured) outfitted with the ALPR technology with the hope of expanding to additional vehicles in the future. The funding for the ALPR system was provided by the Ministry of Attorney General via a Civil Remedies for Illicit Activities grant. · Trick-or-Treat in a group; it’s safer and more fun! ***Please note*** In an effort to help keep children safe on Halloween night, Cogeco employees will be out in their branded white vans patrolling the streets on Saturday, October 31st from 5:30 p.m. to 8 p.m. in the areas where children are Trick or Treating. Cogeco is encouraging parents and children to approach one of these Cogeco vans if at any point they think they are in need of assistance. A free peer-to-peer safety app called Companion is getting a lot shares on social media around the world, and in Peterborough. Companion—which was created by five students from the University of Michigan—allows users to request a friend or family member to keep them company and virtually track their journey home on GPS.